This story about restorative justice was produced by The Hechinger Report, a nonprofit, independent news organization focused on inequality and innovation in education. Sign up for the Hechinger newsletter. With just two words, a classroom can be thrown into chaos. Anne Gregory, an associate professor of psychology at Rutgers University, recalls just such a scenario when an angry high school student shouted an expletive (“F— off!”) at his teacher, bringing class to a halt. Gregory, who studies school discipline, wasn’t present for the outburst itself but she saw its aftermath. At many schools, she explains, the response would be simple: send the student straight to an administrator to mete out punishment, probably a suspension. Instead, the vice principal came to the classroom. He dismissed most students for their lunch break while inviting anyone who felt personally affected by the incident to remain in the room with the teacher and the outspoken student. Then that smaller group, under the vice principal’s guidance, discussed what had just happened. Gregory was witnessing a restorative circle. It’s a practice derived from a movement in education known as restorative justice, an approach to discipline that replaces punishment with repairing harm. And it is sweeping across schools nationwide. In the classroom Gregory observed, all those gathered shared their perspective. The teacher expressed remorse for reacting to the student’s outburst with so much frustration. Another student reflected on her own struggles with anger management. And the young man whose words sparked the incident apologized and described how the stress of a difficult morning had boiled over in his behavior. He then agreed to help his teacher set up her Powerpoint and distribute textbooks at the beginning of each class as a way of compensating his classmates’ lost instructional time. The incident neatly illustrates how the restorative process brings a community together at a moment when, traditionally, conflict might divide the classroom. But is it worth all of that effort? Evidence from the court system, school surveys and controlled experiments suggests restorative justice can indeed do a lot of good. Although more studies are needed to explore its full effects on schools, the research thus far hints that this approach to discipline helps people feel respected and that they, in turn, show greater respect for rules. To understand restorative justice, it’s worth looking at its roots. About forty years ago, criminal justice scholars and reformers in North America and Europe began exploring justice across cultures and studying the perspectives of perpetrators. “Eye for an eye” thinking, they found, may be a longstanding part of Western society, but that’s not true everywhere: some communities place reconciliation above retribution. Inspired by this realization, the restorative justice movement was born. Restorative justice courts in countries including New Zealand, Rwanda and South Africa, for example, developed restorative practices based on the traditions of indigenous communities to address issues as diverse as genocide and petty theft. Much like the restorative circle Gregory witnessed, these courts bring victims and offenders together in dialogue to discuss each person’s perspective. Offenders have to take responsibility for their actions and commit to a plan to mitigate the damage they’ve caused. Behavioral science hints at many advantages of this approach. First, although punishment has its uses — for instance, it warns everyone in a community that there are consequences to bad actions, which in turn make us more willing to cooperate with one another — it is also an imperfect deterrent. In criminal justice, after all, experts broadly recognize that people convicted of crimes have a high likelihood of reoffending. Restorative justice, meanwhile, with its emphasis on community, empathy and perspective-taking, may make up for some of the shortcomings of traditional disciplinary action. In the U.S., for example, juvenile courts that practice restorative justice have significantly reduced recidivism compared with those using traditional approaches. “It’s incredibly amazing what can happen in these courts,” FeldmanHall says. “They’ve been very good at keeping young teenagers from going back to jail.” The thinking goes that the highly participatory process that characterizes restorative justice requires offenders to engage with and understand how their actions have affected others; in turn, the community has to reckon with what drove a perpetrator’s behavior. Encouraged by such successes, psychologists and educators have attempted to translate this work to school discipline. One such translator is Kathy Evans, an associate professor of education at Eastern Mennonite University, co-author of The Little Book of Restorative Justice in Education. She sees three central priorities at the movement’s core: relationship-building, repairing harm and creating more equitable environments. “Restorative justice can’t just be a set of things that we do,” Evans says. “It has to be a framework for how we view teaching and learning.” For example, whereas traditional school discipline emphasizes managing bad behaviors, restorative approaches start by encouraging students and teachers to embrace the idea that all members of the school community should be treated with dignity and fairness. The circle process, in which every voice is heard and multiple perspectives considered, is one example. As a result, proponents argue, students take the school’s rules more seriously because they feel more invested in that community and their school relationships. And there’s evidence for that effect. In 2016, a study led by Jason Okonofua, a professor of psychology at the University of California Berkeley, found that a brief empathy training program for middle-school teachers not only changed their behavior but shifted student perspectives. Post-intervention, the team found, middle schoolers felt more respected and motivated to behave better. Another study from Anne Gregory and her colleagues surveyed 412 students across 29 classrooms where teachers had received restorative justice training specifically. The researchers found that the more teachers immersed themselves in restorative practices, the better students rated their relationships with these teachers. And the strong relationships in turn linked to a greater sense of respect between teacher and student and fewer disciplinary referrals. Given these findings, it’s perhaps unsurprising that restorative practices are popular with students. In fact, at least some teens and kids adopt the techniques for their own use. 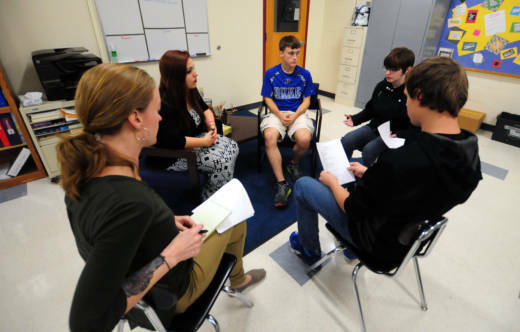 A 2016 study from researchers from the University of Maine at Farmington and University of Illinois at Urbana-Champaign discovered that many students liked restorative circles so much that they used circles as alternatives to fights in out-of-class disputes. However, further study is needed to explore all of the possible effects. For example, supporters of restorative justice sometimes tout its potential to reduce racial disparities in discipline. Recently, Gregory and several colleagues studied suspension data from a Colorado school district to explore that question. They found that schools employing restorative responses to disciplinary problems issued fewer out-of-school suspensions than those without such interventions. Yet restorative justice did not, in fact, alter the fact that black students receive disproportionately more suspensions. Additional research will be needed to suss out why. One factor that co-author Yolanda Anyon, an assistant professor at the University of Denver School of Social Work, flags is that schools implement restorative justice in various ways. “What’s happening that’s unfortunate is that restorative justice is being seen as just an alternative to suspension,” she says. Instead, because restorative justice is really, fundamentally, meant to entail a shift in mindsets, it’s a substantial investment of time and energy. “People at every level of the school community need to be on board and fully immersed in both the practice and philosophy of restorative justice,” Gregory says.